You might already know that Game of Thrones filmed a pilot that never aired. With different actors playing Daenerys and Catelyn, and a few other changes. Not much is known about this earlier Thrones pilot, except for a few hints — but a copy of the script was posted online. Here's all the scoop about the Westeros you never saw. 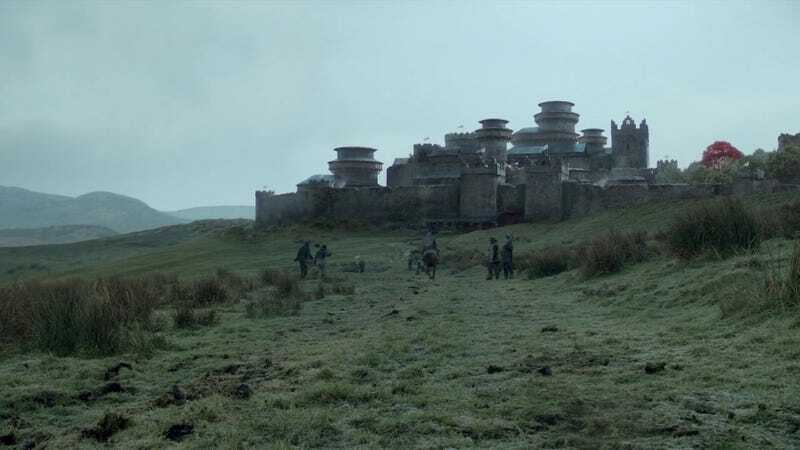 The original Thrones pilot was filmed in the fall of 2009, directed by Thomas McCarthy in Scotland and Morocco instead of Northern Ireland, Malta and Croatia like the aired episode. A few scenes from this pilot made it into the aired pilot, but most of it was scrapped and redone. In 2011, producers David Benioff and D.B. Weiss told us that they watched this version of the pilot with their friends who hadn't read the books — and at the end of the hour, their friends had no clue Jaime and Cersei were brother and sister. Before we delve in, a caveat: We're not 100 percent certain that this pilot script is genuine, but it seems to be. Also, of course, we can't be sure this is exactly the script that was used for filming, or that there weren't tons of rewrites on set. At the same time, it fits in with everything we've heard about the original pilot and the choices that it made differently. So how is the original unaired pilot different from the version that aired? TL;DR: The pilot version is closer to the book, and everything feels a bit stiffer. The language is generally more formal, and the scenes go on longer and are more draggy. A lot of crucial exposition is left out or unclear, and the characters' relationships aren't highlighted the same way. The Stark family, in particular, feels way less like a real family of people who love each other in the pilot script. Most of all, reading the unaired pilot makes you realize just how many clever choices Benioff and Weiss made in the aired version, and in the show generally, to make this huge and sprawling world both comprehensible and irresistible. 1) We get a really close look at the Others. Instead of that amazing shot of the rangers walking out of the Wall, the pilot starts out with Will, the poor doomed ranger, staring at the frozen corpses (who aren't decapitated, or nearly as creepy, in the pilot script. Nor are they arranged in a weird pattern, as they are on screen.) Also, Ser Waymar Royce, the loutish commander of the group, has way less dialogue than he gets in the aired version — he pretty much just doubts Will's word about the dead Wildlings, and then goes to investigate and gets killed. Ser Waymar has maybe five lines of dialogue total. By contrast, the aired episode uses Royce to give us a big chunk of context without ever seeming overdone. And then instead of just a few glimpses of zombified Wildlings, the original pilot script gives a really good, long look at seven of the Others, "tall and gaunt, with flesh pale as milk," with armor that "appears to be carved from ice" and translucent swords. They speak to each other in a strange language, "with voices like cracking ice." The actual program doesn't give us such a good look at the Others until the end of season two. 2) The credits sequence is very different. Instead of the beautiful "orrery" theme that the show eventually chose, there's a sequence where an old man, whose face we don't see, writes a message on a parchment scroll, which he ties to the leg of a raven. The raven flies away from Castle Black and the Wall and across the landscape of Westeros, which becomes a map. The major destinations are labeled, including Winterfell, the Kingsroad, Moat Cailin, the Riverlands and the Vale of Arryn. A few times, the bird dips down enough that the map "resolves into reality" to show us the towers of Winterfell or the Eyrie atop the Vale. At last, the bird reaches King's Landing and flies through the open gates of the Red Keep, landing on the Iron Throne itself. You can see why this might have sounded like a good idea, what with the books' emphasis on ravens as messengers. 3) Less of an introduction to the Starks. Just like in the book, we pick up with Eddard Stark and his party riding out to an execution — there's no scene of the deserter being captured. And just like in the book, the captured deserter is Gared, not Will. There's also no scene in the unaired pilot of Bran practicing archery with Jon and Robb, while Sansa and Arya do needlepoint — which is pretty crucial in establishing the whole Stark family and their relationships. (We do get a bit more of the Stark children later in the pilot.) Also, we don't get to hear the deserter telling Ned Stark that he saw the White Walkers. And Ned, not Bran, says "Our way is the old way" in the pilot, which is less interesting. 4) Theon is way more of a loudmouthed jerk. Again, like the book, we don't see a dead stag — just a dead direwolf with an antler stuck in it. And when they find the dead direwolf, they don't realize at first that it has pups. Theon is much more aggressive and scornful about the direwolf pups, and Ned Stark barely speaks at all in the pilot version of the scene. It's Theon, not Ned, who proposes killing the pups, going so far as to seize one of them and raise his sword. When Jon finds the small white wolf, Theon scoffs, "An albino. That one will die even faster than the others." But Jon says this one is his. Throughout the script, there are scene directions like, "Theon watches with his characteristic wry contempt." 5) We meet Daenerys way earlier. In the aired episode, it takes 33 minutes of Starks and Lannisters before we get our first look at the exiled Targaryens. But in the pilot version, we jump straight from the direwolf pups to Pentos, where Daenerys is trying on a new gown. This is even faster than in the book, where we get Ned's reaction to Jon Arryn's death before meeting Daenerys. You can see why they moved Daenerys' introduction further back — in the pilot, it feels jarring, because we've only just met the Starks, then we meet the Targaryens, after which we meet the Lannisters. The actual scenes between Daenerys and Viserys (and Illyrio and Drogo) play out more or less the same, although stuff happens in a somewhat different order, somewhat closer to the book. Now we're getting into stuff that's not like the book in either version. Both versions of the first episode have scenes where Cersei looks at the dead body of Jon Arryn. But in the pilot, the Silent Sisters are only just closing Arryn's eyes. And instead of talking to her brother Jaime, Cersei talks to Grand Maester Pycelle about Jon Arryn's final moments, and the fact that Arryn kept saying 'The seed is strong." Cersei does mention that her husband the King is off hunting, and Pycelle drops the information that Lord Arryn's wife left the capital the moment her husband breathed his last. But this scene is way less informative than the aired version, where Cersei and Jaime basically tell the viewers they're brother and sister and they're sleeping together. You told me once that you wanted to see the North. I didn't want you to miss your chance. The King. The Queen. Me. You, if you can find your pants. Well, I'm used to it, but the rest of the court might be frightened by the sight of your wet little dagger. Why are we going north? The King has chosen his Hand. And nobody's going to be happy about it. 8) The pilot has a lot less of the Stark family. The scenes of Catelyn and Maester Luwin preparing for the arrival of their guests, and Jon, Robb and Theon getting shaved and prettied up for the Queen, aren't in the pilot script — they were added later, and it's easy to see why. They help to flesh out the characters and add some build-up to the King's arrival. Also, the scene in the godswood where Catelyn tells Ned that Jon Arryn is dead is a lot stiffer and less naturalistic in the pilot, and it detours into a big argument over whether Bran should have witnessed the deserter's execution. And there's none of that business of Arya wearing a helmet, in the pilot script. Finally, the pilot script also lacks the scene where Cat brushes Sansa's hair and Sansa obsesses over whether Joffrey would like her. 9) The crypt scene is a lot longer in the pilot. In the aired TV episode, we get a couple brief snippets of Ned Stark and King Robert visiting the Stark family crypt so King Robert can pay his respects to Lyanna, Ned's dead sister. But that sequence goes on much longer in the pilot, and is one long scene rather than two short ones. It ends with Robert saying he never loved his brothers, but Ned was "the brother I chose. We were meant to be family." Robert also seems more openly disrespectful of his wife in the pilot version. 9) Tyrion pets Ghost. Just like in the book, Tyrion admires Jon Snow's direwolf, although Tyrion is concerned that he's frightened the beast. "He's not afraid," Jon says. To which Tyrion responds, "He is! I am terrifying!" And then Tyrion actually gets to pet the direwolf, saying "Niiiiice wolf." Also, the scene between Jon Snow and Benjen Stark goes on much longer in the pilot, and hews a lot more closely to the book. 10) The Feast scenes play out somewhat differently. In particular, in the original pilot both Cersei and Jaime talk to Catelyn, and they only admire Sansa from a distance — there's none of the scene where Sansa comes up and talks to Cersei about dress-making and stuff. The pilot script also lacks the scene where Benjen and Ned Stark talk about the deserter that Ned executed, and the possibility of White Walkers coming back. Meanwhile, the confrontation between Ned and Jaime Lannister goes on much longer in the pilot, with Jaime taunting Ned about his father's death at the Mad King's hands. Jaime says he gave Ned justice, but Ned shouldn't bother to thank him — oh, wait, Ned never has. (I think some of this conversation was moved to another episode, later in the season, where it transpires in the throne room.) Later, Jaime laments to Tyrion that people treat him like some "back-alley cutthroat," just because he killed the worst king in 1,000 years. Tyrion responds that he'd bet on Jaime in a fight between Jaime and Ned, "but I wouldn't bet much." Cersei watches Tyrion stumble outside and tells Jaime that their brother is a "vile little beast." Jaime responds that Tyrion "plays the hand he was dealt — as do we all." Over that last bit, Jaime looks over at the drunken lecherous King Robert. 11) Catelyn tells Ned he must go to King's Landing. The conversation between Ned and Catelyn is way closer to the book in the pilot, with Catelyn telling Ned he must go to King's Landing — instead of the version that aired, with Catelyn saying, "I won't let him take you." (And the pilot script keeps the thing from the books of Catelyn and her sister Lysa having their own private childhood language.) After Catelyn gets Lysa's message in the pilot script, she is even more resolute that Ned must go south with the King, to which Ned responds, "I am not your dog to command, my lady." In general, the relationship between Ned and Catelyn is much less loving in the pilot script — they seem like they barely tolerate each other. They're not in bed together in the pilot, just sitting together. Ned is much frostier in the pilot, and Catelyn is much more uptight, and the kids barely get any good moments. Oh also, the pilot has that scene from the books where Bran spars with Prince Tommen while Arya wishes she could join them.